Pentecost, sometimes called "the birthday of the church," was an extraordinary event, nearly as momentous as Christ's resurrection itself. On Pentecost, the Holy Spirit entered the disciples, inspiring, animating, and emboldening them to go forth and share Jesus' message of salvation, reconciliation, and peace with the world. 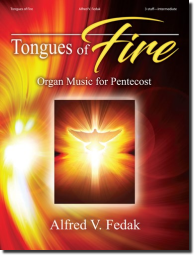 This collection of organ pieces celebrates this festival of the Holy Spirit in all its aspects with music based on hymns spanning eleven centuries of the church's history. The pieces are useful as separate selections for service playing or in larger groupings (or a complete suite) for recital.